However their data rates are really cheap, so it is worth persevering. Take a deep breath, then head over to their registration page and sign up for an account. 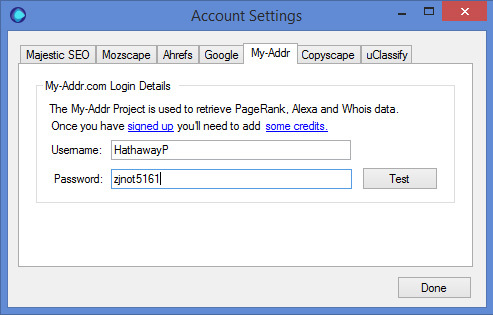 After what seems like an absurdly long time, my-addr will create your account and log you in. You will need to add your username and password to URL Profiler Account Settings. Once you have added your details, click the ‘Test’ button and make sure the account can successfully connect. Now you will need to add credit to your account. Before you can use my-addr, you will need to add some credit. For some reason they hide this option in their obscure navigation, so just head over to their Alexa Checker Page. Even if you were logged in previously, it will prompt you to sign up to a new account. 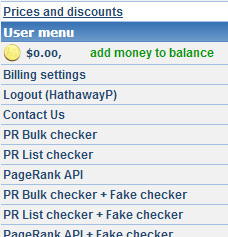 Just click ‘Login to billing account’ and log in through there.